Left: The New Orleans Muffaletta; enjoy with your favorite cold brew. 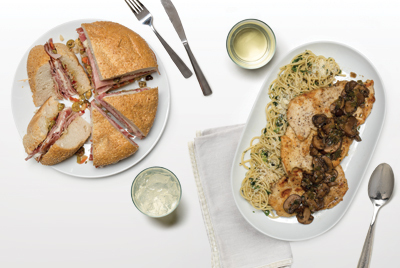 Right: Chicken Marsala with Pasta Bordelaise; pair with an oaky Chardonnay. 1. Mix olive salad ingredients at least a few hours ahead of time in order for them to marinate. Place in a jar or closed container. 2. Slice muffaletta loaves in half horizontally and place inside up. Spread each with the olive salad, and pour remaining liquid over all. Then alternate the meats and cheeses on the bottom sides and carefully cover with tops. Wrap in foil and let marinate for at least an hour before serving. The sandwich is usually served cold, cut into fourths or smaller wedges. If you prefer it heated, place in a preheated 350-degree oven, still wrapped in foil, for 15 minutes before cutting. Serves 2 to 4. *Muffaletta loaves are not widely available at retail stores. Rouses and Breaux Mart make 7-inch seeded Italian muffaletta loaves. 1. Prepare the chicken, and sprinkle liberally with sea salt and freshly ground black pepper, pressing the seasonings into the cutlets. Put flour on a plate and heat the oil in a large, heavy skillet. When hot, dredge the chicken in the flour, shake off excess and brown on each side, a couple of minutes each. Take the cutlets up as you brown them and place on a plate. 2. Reduce heat to medium; add garlic and onions to the skillet and sauté for 2 minutes. Add butter and then mushrooms, red pepper flakes and Italian seasoning and cook, stirring for several minutes until the mushrooms have softened and given up some liquid. Add Marsala and chicken broth, cover and simmer for 10 minutes. Stir in parsley. This is good served with pasta Bordelaise. 3. Pasta Bordelaise: In a large pot of salted water, boil 1 pound spaghetti until al dente. In a medium skillet, heat ¼ cup extra-virgin olive oil. Sauté 4 cloves of crushed garlic and 4 green onions, chopped, 1 teaspoon Italian seasoning, sea salt and freshly ground black pepper for several minutes. 4. Add 1-tablespoon butter and ¼ cup chopped flat-leaf parsley and cook 1 more minute. Pour over drained pasta. Add 3/4 cup good quality grated Parmesan cheese and toss. Adjust seasonings. Serves 6. Left: Eggplant Parmigiana; complement this dish with a medium-bodied Merlot. Right: Bracio La aka Bruccioloni; pairs well with a strong, bold Chianti. 1. Slice eggplants into ½-inch rounds. Sprinkle with salt on both sides and stack between two plates for 45 minutes, pouring off water as eggplant sweats. Dry eggplant with paper towels. 2. Brush a large baking pan with a light coat of olive oil. Lay eggplant slices on the pan and brush other side with olive oil. Sprinkle with freshly ground black pepper. Place in oven and cook until eggplant is browned. The bottom side may brown faster. Turn and brown the other side. Remove from oven, and lower heat to 350 degrees. 3. Brush a 13-by-9-inch-inch baking dish or oval baking dish of similar size with a light coat of olive oil. Then spread 1/3 of the red gravy. Top with half the eggplant slices and another third of the red gravy. Sprinkle with half of the basil, half of the mozzarella and half of the Parmesan. Repeat, beginning with remaining eggplant, red gravy, basil, mozzarella, and Parmesan. Cover with breadcrumbs and bake until bubbly and brown on top, about 30 minutes. Serves 6 to 8. 1. On a chopping board, pound round steak to ¼-inch thick. Cut into 6 or 7 pieces, as equal in size as possible, approximately 5-by-6 inches each. Salt and pepper both sides of meat. Set aside. 2. Heat 2 tablespoons of the olive oil in a skillet and sauté onions, celery and garlic until transparent. Remove from heat and add Romano cheese, eggs, parsley, bread crumbs, salt and pepper, and mix well. Spread equal parts of mixture on each piece of steak. Roll up to form roulades and tie with kitchen twine, tucking ends. 3. In a clean skillet, heat remaining olive oil and brown roulades over medium-high heat until brown on all sides. Remove from heat. 4. Heat red gravy in a large pot and add roulades. Simmer, covered, for 1 ½ hours or until meat is tender. Serve with pasta. Serves 6. Red gravy: Heat 4 tablespoons extra-virgin olive oil in a large, heavy pot. Add 2 medium onions, chopped, 2 stalks celery, chopped, and 2 tablespoons minced garlic, and sauté until transparent. Add 12 ounces tomato paste and cook, stirring, until it begins to brown. Add one 28-ounce can of imported whole Roma tomatoes, such as Cento’s, chopping tomatoes with a spoon. Add 2 teaspoons Italian seasoning, 2 bay leaves, 2 teaspoons sugar, salt and pepper to taste and 2 cups water. Stir well and simmer, covered, for 2 hours, stirring occasionally. Remove bay leaves. Makes about 2 quarts. Left: Crab-Stuffed Artichokes with Alfredo Sauce; enjoy with a light, bubbly prosecco. Right: Osso Buco; pair with a bold red. 1. To trim artichokes, use a sharp, heavy knife to cut about ½ inch off top of artichokes. Use scissors to snip off the prickly tips of the leaves. Cut off stem so that the artichokes sit flat. Rinse well and drain. Place 1 inch of water in a wide pot and insert a steamer basket. Place artichokes on top and sprinkle with salt. Cover and heat water to a simmer and cook until artichokes are tender when the bottoms are pierced with a fork, about 20 minutes. Drain and cool. 2. To make the stuffing, pick through crab meat to make sure there are no pieces of shell, being careful not to break up crab meat. Place in medium bowl. Add capers, lemon juice, bread crumbs, olive oil, seasoning, hot sauce and parsley, and toss gently. 4. Remove small, pale center leaves from artichoke, keeping all heavy leaves intact. With a spoon, preferably a grapefruit spoon, scrape out the fuzzy choke, leaving the heart intact. Place artichokes in an 8-by-8-inch baking dish. First stuff the center cavity of each artichoke with the crab mixture, using about ¾ cup. Then open each leaf gently and stuff with spoonful of crab mixture. Stuff all of the large leaves, and use up any remaining stuffing in centers or leaves of artichokes. 5. To make the sauce, melt butter in a medium saucepan. Stir in olive oil, add garlic and sauté for 2 minutes over low heat. Stir in heavy cream, then gradually add half the Parmesan and then mozzarella. Simmer, stirring, until cheese is melted. 6. About 30 minutes before serving, pour as much of the sauce over the artichokes as needed to almost fill the cavities. You may have some left over. Sprinkle with remaining Parmesan. Place in oven until bubbly and beginning to brown. Serves 4 to 6 as appetizer or side dish. 1. Sprinkle veal shanks with salt and pepper, pressing seasonings into meat. Tie shanks with kitchen twine to hold meat together during cooking. Place flour on a plate and dredge shanks to make a light coat over all. 2. Heat oil in a large heavy pot and brown shanks a few minutes on each side. Remove from pot. Add and sauté onions and carrots until onions are transparent. Add garlic and sauté 1 minute. Pour in liquid from tomatoes. Chop tomatoes and add to pot, along with a little more salt and pepper, wine, broth, Italian seasoning and rosemary. Bring to a boil, cover and reduce heat to low. Simmer for 1 ½ hours, stirring and turning occasionally. Add more broth if needed. Meat should be very tender. 3. To serve, remove twine from shanks. Place one shank on each plate with gravy and stems of rosemary and parsley for garnish. Serve with pasta, risotto or polenta and horseradish sauce on the side, if desired. Serves 4. Note: For a quick horseradish sauce, mix 3 tablespoons fresh horseradish, ¼ cup sour cream, ¼ cup mayonnaise, 1 tablespoon Creole mustard and sea salt and freshly grated black pepper to taste.